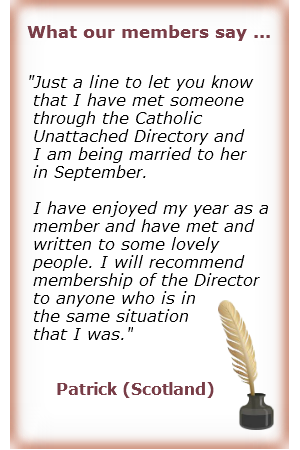 When you registering with the Catholic Unattached Directory you are immediately enjoy FREE membership of the Dirctory. FREE membership allows you to enter the site and have a good nose around. But you will only be able to see gentleman/ladies who actually want to date someone of your age and gender. Think of it as like going to a dance and finding that every lady/gentleman in the room who would like to dance with you has an arrow above their head that only you can see - how useful would that be? The next step is to submit your own profile so that members can also see you, until you do this you remain invisible to other members. Once you have submitted your profile and it has been accepted by us, other members will be able to see you and let you know that they are interested in your profile, although they will not be able to contact you. FREE membership enables you to evaluate the site at your leisure, and decide whether or not there are sufficent potential contacts of interest to you for it to be worth your while to upgrade to premium membership. Once you upgrade to premium membership, you can date and be dated by other members. To upgrade to premium membership, in addition to submitting your profile and having it accepted, you need to make a small contribution to our costs. Note: nothing is published in the Directory that could identify you. Members are by default described as “John from London” or “Mary from Dublin” or similar. We also have the facility for members to be known by a name other than their real name if they prefer. This is seldom truly necessary, except on those rare occasion when people have very unusual ethnic names that may possible identify them. In many cases the potential dates may be very extensive, perhaps even several hundred. This means that you must devote some quality time going through your directory and short listing those members who from their description appear to be the sort of person with whom there was a potential for a friendship. You then need to contact them. Obviously, if they publish their email address, you can email them. However, most members caontact one another use the secure message vault accessed direct from the this website. Messages of course goes both ways, and people exchange messages until they feel comfortable enough to take it a step further. What that step is, is entirely up to the two people involved. However, experience suggests that they either exchange telephone numbers and have a chat on the telephone or they meet up for a pub lunch or something similar.